How well do you know the following media? This statistic shows a survey on level of knowledge of selected media in Sweden in 2016. 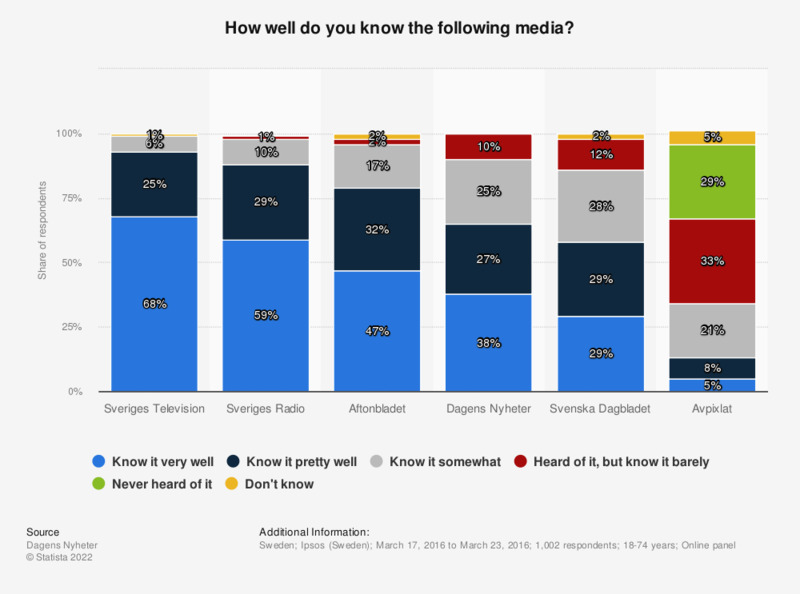 During the survey period, it was found that 38 percent of Swedish respondents stated to know the daily newspaper Dagens Nyheter very well. This question was phrased by the source as follows: "Hur väl känner du till...?" Statistics on "Media usage in Sweden"
How often do you watch movies or videos on the internet? How often do you listen to radio stations on the internet? How often do you read daily newspapers on the internet? How often do you read e-books on the internet? How often do you usually watch films or TV program in your leisure time? Could you tell me to what extent you listen to the radio? How often do you listen to radio using the following platforms? How often do you usually play video games in your leisure time? How long do you play video games on an average day? How much trust do you have in the following media? To which of the following media do you combine the word trustworthy?